Jesse Buell FARR [Parents]-6336 was born on 20 Oct 1803 in Bristol, Addison, Vermont, United States. He died on 23 Nov 1887 in Bristol, Addison, Vermont, United States. Jesse married (MRIN:2811) Hannah SUMNER-6344 on 30 Oct 1824 in Bristol, Addison, Vermont, United States. Jesse was counted in a census 1 in 1850 in Lincoln, Addison, Vermont, United States. He was counted in a census 2 on 18 Jul 1860 in Lincoln, Addison, Vermont, United States. He was counted in a census 3 in 1880 in Bristol, Addison, Vermont, United States. Was named after his mother's uncle, Jesse Buell (see information on Leonard Farr, Jesse's brother). CENSUS: Age 46 farmer, Hannah 43, James 24, Harvey 22, Clarissa 15, Horace 14, July 10. CENSUS: Age 56, farmer, Hannah 55, Harvey 32, Margette 26, Wallace 4, Peter Baslow 17 farm laborer. Hannah SUMNER-6344 was born in 1805 in Vermont, United States. Hannah married (MRIN:2811) Jesse Buell FARR-6336 on 30 Oct 1824 in Bristol, Addison, Vermont, United States. Hannah was counted in a census 1 on 18 Jul 1860 in Lincoln, Addison, Vermont, United States. James Johnson FARR-6354 was born 1 on 26 Oct 1825. He died 2 on 23 Aug 1903 in Weybridge, Addison, Vermont, United States. Is listed as 'Jarvis Farr' in the 1850 federal census of Addison County, Vermont, compiled by Juliet Lesley Smith, FHL US/CAN film #824185, Item 2, Vol. IV, p. 42. M ii Harvey Holly FARR-6337 was born on 26 Jan 1828. He died in 1899. F iii Hannah FARR-6571 was born on 28 Sep 1831. Clara Lovina FARR-6366 was born on 16 Mar 1834 in Lincoln, Addison, Vermont, United States. M v Horace FARR-6479 was born about 1836. He died on 1 May 1907. July FARR-6480 was born about 1840 in Lincoln, Addison, Vermont, United States. Harvey Holly FARR [Parents] [scrapbook]-6337 was born 1 on 26 Jan 1828 in Lincoln, Addison, Vermont, United States. He died in 1899. Harvey married 2 (MRIN:2812) Marietta PALMER-6345 on 27 Nov 1853 in of Lincoln, Addison, Vermont, United States. Harvey was counted in a census 3 in 1850 in Lincoln, Addison, Vermont, United States. He was counted in a census 4 on 18 Jul 1860 in Lincoln, Addison, Vermont, United States. He was counted in a census 5 on 16 Jun 1870 in Lincoln, Addison, Vermont, United States. He was counted in a census 6 in 1880 in Lincoln, Addison, Vermont, United States. Farr, Harvey, Lincoln, was born in Lincoln, Vt., on January 26, 1828. He was a son of Jesse B. Farr, of Bristol, Vt. Harvey Farr has always resided in the town of Lincoln, Vt., with the exception of two years, which he spent in another part of the State. He has been one of the most successful farmers of his town, and is a much respected citizen. He has been married twice. His first wife was Mariette Palmer, a daughter of Simeon and Fannie Palmer, to whom he was married on November 27, 1853, and by whom he had a family of three children: Wallace S. (born on February 17, 1856), George W. (born on February 22, 1862), and Frank C. (born on September 8, 1869). 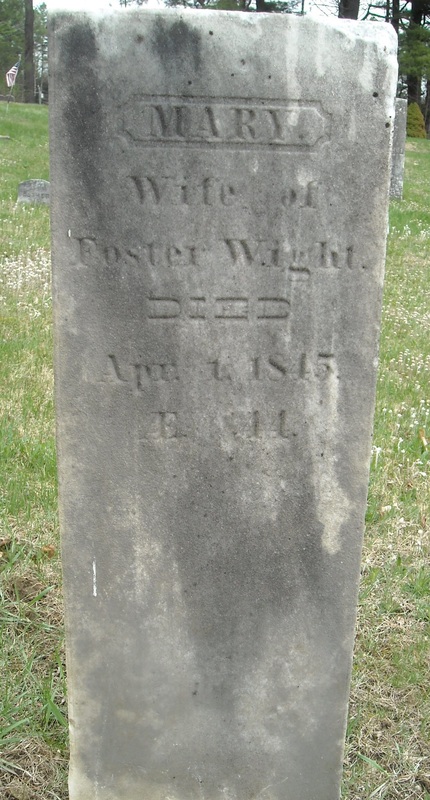 Mrs. Farr died on November 15, 1870. Mr. Farr then married his second wile, Marinda Pickett, on April 30, 1872. She was a daughter of Rev. Zenas Pickett. By his second wife Mr. Farr has had a family of two children bord to him: Jesse Z. (born on April 16, 1875) and Addie L. (born on March 5, 1883). 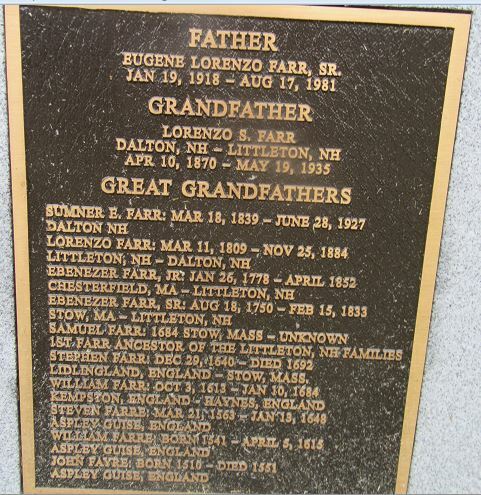 Mr. Farr represented his town in the Legislature in 1882, has been an overseer for nineteen years, was justice of the peace in 1870, '76, and 1881; was selectman in 1868 and various times since that date, and has also been a member of the Republican county committee. CENSUS: Age 32 son of Jesse B Farr, Margette 26. Marietta PALMER [scrapbook]-6345 was born 1, 2 on 23 Jan 1834 in Lincoln, Addison, Vermont, United States. She died 3, 4 on 15 Nov 1870 in Lincoln, Addison, Vermont, United States. Marietta married 5 (MRIN:2812) Harvey Holly FARR-6337 on 27 Nov 1853 in of Lincoln, Addison, Vermont, United States. Marietta was counted in a census 6 on 18 Jul 1860 in Lincoln, Addison, Vermont, United States. She was counted in a census 7 on 16 Jun 1870 in Lincoln, Addison, Vermont, United States. M i Wallace S FARR-6338 was born on 17 Feb 1856. He died on 20 Oct 1915. M ii George Washington FARR-6352 was born on 22 Feb 1862. He died on 28 Mar 1939. M iii Frank Cyrus FARR-6353 was born on 4 Sep 1869. He died on 4 Mar 1944. Harvey Holly FARR [Parents] [scrapbook]-6337 was born 1 on 26 Jan 1828 in Lincoln, Addison, Vermont, United States. He died in 1899. Harvey married 2, 3 (MRIN:2813) Marinda A PICKETT-6393 on 30 Apr 1872 in Lincoln, Addison, Vermont, United States. Harvey was counted in a census 4 in 1850 in Lincoln, Addison, Vermont, United States. He was counted in a census 5 on 18 Jul 1860 in Lincoln, Addison, Vermont, United States. He was counted in a census 6 on 16 Jun 1870 in Lincoln, Addison, Vermont, United States. He was counted in a census 7 in 1880 in Lincoln, Addison, Vermont, United States. Marinda A PICKETT-6393 was born 1 on 14 Oct 1839 in Otisco, Onondaga, New York, United States. She died 2 on 6 Apr 1899 in Lincoln, Addison, Vermont, United States. Marinda married 3, 4 (MRIN:2813) Harvey Holly FARR-6337 on 30 Apr 1872 in Lincoln, Addison, Vermont, United States. M i Jessey Zenas FARR-6394 was born on 16 Apr 1875. He died on 17 Oct 1951 from of cardiac failure. Addie Louise FARR-12055 was born on 5 Mar 1883 in Lincoln, Addison, Vermont, United States. She died on 21 Oct 1966 in Port Arthur, Jefferson, Texas, United States. Wallace S FARR [Parents] 1-6338 was born on 17 Feb 1856 in Lincoln, Addison, Vermont, United States. He died 2 on 20 Oct 1915 in Lincoln, Addison, Vermont, United States. Wallace married 3, 4 (MRIN:2814) Sarah Ann GREEN-6343 on 20 Mar 1878 in Lincoln, Addison, Vermont, United States. Wallace was counted in a census 5 on 18 Jul 1860 in Lincoln, Addison, Vermont, United States. He was counted in a census 6 on 16 Jun 1870 in Lincoln, Addison, Vermont, United States. He was counted in a census 7 in 1880 in Bristol, Addison, Vermont, United States. He was counted in a census 8 on 2 Jun 1900 in Lincoln, Addison, Vermont, United States. No listing of son Donald in the 1910 census. Wallace was indexed under Walter S Farr. CENSUS: Age 14, son of Harvey Farr. CENSUS: Age 44, wife Sarah A. 41, daughter Jeannie B. 18, son Fred F. 16, son Ray W. 12, Marietta E. 8, Seymour M. 4, Harvey H. 7 months. Sarah Ann GREEN-6343 was born on 4 Dec 1858 in Lincoln, Addison, Vermont, United States. She died 1 on 7 Apr 1905 in Lincoln, Addison, Vermont, United States. Sarah married 2, 3 (MRIN:2814) Wallace S FARR-6338 on 20 Mar 1878 in Lincoln, Addison, Vermont, United States. Sarah was counted in a census 4 in 1880 in Bristol, Addison, Vermont, United States. She was counted in a census 5 on 2 Jun 1900 in Lincoln, Addison, Vermont, United States. M i Ashley Victor FARR-6356 was born on 16 Sep 1879. He died on 28 Nov 1952. F ii Jeannie B FARR-6477 was born on 29 May 1882. She died on 15 Mar 1942. M iii Fred Floyd FARR-6339 was born on 23 Mar 1884. He died on 15 Oct 1953. M iv Raymond Wallace FARR-6389 was born on 7 Aug 1887. He died on 1 Dec 1946. Justin FARR-11930 was born 1 on 21 Oct 1889 in Lincoln, Addison, Vermont, United States. He died 2 on 3 Nov 1889 in Lincoln, Addison, Vermont, United States. Marietta E FARR-6390 was born 1, 2 on 26 Jul 1891 in Lincoln, Addison, Vermont, United States. Marietta was counted in a census 3 in 1930 in Lincoln, Addison, Vermont, United States. CENSUS: Marietta Morgan Head 38, son Ford 14, brother Harvey 30. M vii Seymour Mckinley FARR-6391 was born on 18 Apr 1896. He died on 21 Jun 1964. M viii Harvey Hobart FARR-6392 was born on 8 Oct 1899. He died on 21 May 1953 from of a coronary occlusion. Donald FARR-6478 was born 1 on 11 Dec 1901 in Lincoln, Addison, Vermont, United States. He died 2 on 19 Dec 1903 in Lincoln, Addison, Vermont, United States. Fred Floyd FARR [Parents] [scrapbook]-6339 was born 1, 2, 3 on 23 Mar 1884 in Lincoln, Addison, Vermont, United States. He died 4, 5 on 15 Oct 1953 in Stonington, New London, Connecticut, United States. Fred married (MRIN:2815) Lila Louise SILVER-6471 on 21 Dec 1908 in Middletown, Middlesex, Connecticut, United States. Fred was counted in a census 6 on 2 Jun 1900 in Lincoln, Addison, Vermont, United States. He resided 7 on 12 Sep 1918 in New London, Connecticut, United States. He worked 8 as R. R. Conductor on 12 Sep 1918 in Stonington, New London, Connecticut, United States. Floyd's WWI Draft Registration Card states his nearest living relative as Lila Farr, 33 Mill ST.. New London, CT.
CENSUS: Age 16, son of Wallace Farr. OCCUPATION: Medium height, medium build, gray eyes, and brown hair. Lila Louise SILVER [scrapbook]-6471 was born 1, 2 on 18 Jan 1886 in Caanan, Essex, Vermont, United States. She died 3 on 8 Jul 1976 in Cresent City, Del Norte, California, United States. Lila married (MRIN:2815) Fred Floyd FARR-6339 on 21 Dec 1908 in Middletown, Middlesex, Connecticut, United States. Lila was counted in a census 4 in 1920 in New London, New London, Connecticut, United States. She was counted in a census 5 in 1930 in Portland, Cumberland, Maine, United States. CENSUS: Indexed as Lila G Farr. Age 30, son Gerald age 10. CENSUS: Name: Lila S Farr Age: 38 Estimated birth year: abt 1892 Birthplace: Vermont Relation to head-of-house: Head Race: White Home in 1930: Portland, Cumberland, Maine. Profession: LandLady Business: Rooming House Son: George Farr Age: 19 Birthplace: New Hampshire. M i Gerald Welch FARR-6340 was born on 22 Jan 1910. He died on 8 Sep 1987 from of an aneurysm. Gerald Welch FARR [Parents] [scrapbook] 1-6340 was born 2 on 22 Jan 1910 in Strafford Hollow, Strafford, New Hampshire, United States. He died 3 on 8 Sep 1987 in Santa Cruz, California, United States from of an aneurysm. Gerald married 4 (MRIN:2816) Helen Anna MARDEN-6473 on 16 Sep 1934 in York, Maine, United States. Gerald was counted in a census 5 in 1920 in New London, New London, Connecticut, United States. He was counted in a census 6 in 1930 in Portland, Cumberland, Maine, United States. Age 10, mother Lila G(S) Farr. CENSUS: Age 19 and living with his Mother, Lila S. Farr. Helen Anna MARDEN [scrapbook]-6473 was born 1 on 26 May 1913 in Brookline, Norfolk, Massachusetts, United States. She died 2 in Feb 1996 in Santa Cruz, California, United States. Helen married 3 (MRIN:2816) Gerald Welch FARR-6340 on 16 Sep 1934 in York, Maine, United States. Helen was counted in a census 4 in 1930 in Brookline, Norfolk, Massachusetts, United States. F i Ramona Silver FARR-6474 was born on 3 Nov 1935. She died on 27 Jun 2012. M iii Rupert Edward FARR-6341 was born on 21 Feb 1939. He died on 7 Jun 2014. F iv Lila Helen FARR-6476. Rupert Edward FARR [Parents]-6341 was born on 21 Feb 1939 in Boston, Suffolk, Massachusetts, United States. He died on 7 Jun 2014 in Cheyenne, Laramie, Wyoming, United States. Rupert married (MRIN:2817) Charlotte Louise WEBB-6470 on 11 Mar 1963 in Carson City, Ormsby, Nevada, United States. Rupert E. Farr, 75, of Cheyenne died June 7, 2014 in Cheyenne. M i Rupert Andrew FARR DNA Participant #46956-6342. Rupert Edward FARR [Parents]-6341 was born on 21 Feb 1939 in Boston, Suffolk, Massachusetts, United States. He died on 7 Jun 2014 in Cheyenne, Laramie, Wyoming, United States. Rupert married (MRIN:2818) Barbara GRUNKEMEYER-12041 on 17 Mar 1991 in Las Vegas, Clark, Nevada, United States. F i Mary DAVIDSON-6346 was born in PROB 19 MAR 1749. Abel FARR [Parents] 1-6347 was born 2 in 1775 in Massachusetts, United States. He died in 1861. Abel married (MRIN:2820) Rhoda ORMSBEE-8906 about 1792 in Massachusetts, United States. Abel was counted in a census 3 in 1810 in Huntington, Chittenden, Vermont, United States. He was counted in a census 4 in 1820 in Huntington, Chittenden, Vermont, United States. He was counted in a census 5 in 1850 in Huntington, Chittenden, Vermont, United States. Rhoda ORMSBEE-8906 was born 1 in 1775 in Vermont, United States. She died in 1851 in Huntington, Chittenden, Vermont, United States. Rhoda married (MRIN:2820) Abel FARR-6347 about 1792 in Massachusetts, United States. M i Joel FARR-8908 was born in 1796.